Have a new piece of property but you don’t know where to start? We can help with that. This is the time to plan and organize all your future dreams! Here at Earle Excavating we work on backyards, front yards, patios, retaining walls, artificial turf & sod, septics, boulders and natural stone, etc… We can turn your property into a beautiful frame for the home you love! Define Your Landscape. With our equipment our knowledge and our eye for design, can make any property accessible and picturesque. Wanting a roadway to the water? How about cleaning up an old cottage road! We have the staff, equipment, and all the expertise required to make your roadway a reality. If you have wet areas on your property, have you ever considered having a pond dug? 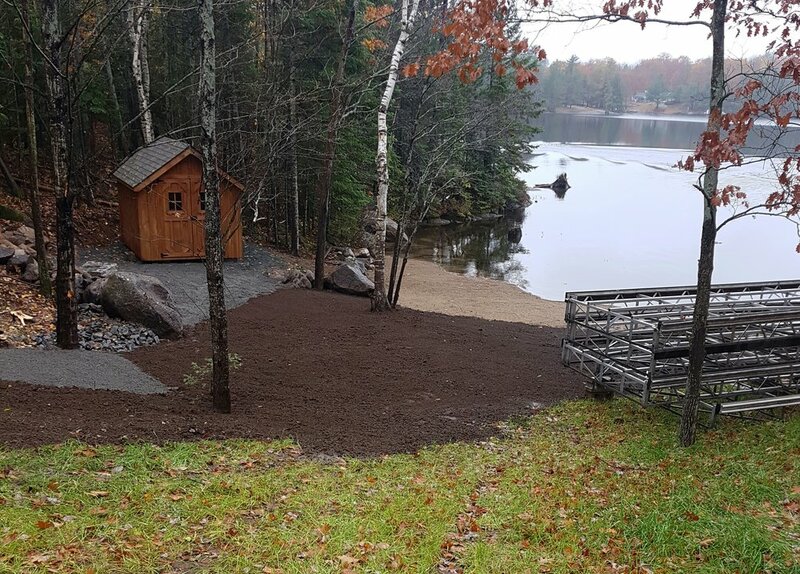 The fill from the pond can be used to build up a low area or for backfill on your own property, this will save you from buying fill and in the mean time you are adding value and beauty to your own property. Almost any sized tree or stump can be removed with the right equipment and a skilled operator. We at Earle Excavating make the removal of trees and stumps hassle free through proficient operation, and a deep respect for our clients property. Running electrical or plumbing services underground can be real hassle without the equipment required or a trained operator. With years of experience on our side, we can make the trench you need, while keeping the landscaping you want! Infiltrator septic system with concrete sewage tank. Building a new home and require a qualified septic system design and installation? Require maintenance or adjustment to an existing septic system? Contact us and get a comprehensive idea on what you need, and how Earle Excavating can get the job done! Welding repairs of all metals. Fabrication of all related products; including steel drainage grates, steel fence and railing, aluminum dock and marine railway. Removing old buildings? Need the old cottage gone? With a complete suite of heavy equipment and M.O.E licenced trucks, we can demolish, sort, load and dump your unwanted materials, all while respecting your property and the environment! A better alternative to sauna tube/ big foot footings! Great for deck’s, dock anchors and additions. No concrete, no digging, no waiting for concrete to dry -no mess to your yard! Commercial and residential snow plowing, removal, and sanding. Servicing the greater Coe Hill area. Want to know how to get started? Give us a call!